For one thing, I love low-budget movies which are given small releases but everyone thought it was really great. And therefore it becomes a landmark in cinema. 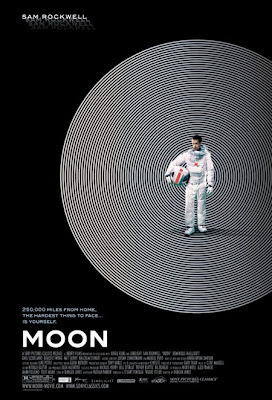 Moon (2009) is a classic example of this, as it is a sci-fi/thriller which everyone went raving mad for. But am I missing something here? Sam Bell (portrayed amazingly by Sam Rockwell) is an employee of Lunar Enterprises and is nearly finished his three year term up on the moon for his company. His only friend there is a computer named GERTY (voiced by Kevin Spacey), which talks and makes 'facial expressions' but is nothing close to normal company. Since Sam has been up there for so long, lunacy gets the better of him, and his longing for home pains him so much, that he starts hallucinating different things. Things get worse when he is required to stay up there for a while longer, and he wants out. Okay, it's a good concept, and I do admit that I was enthralled by it. But it was a little boring. Like the start is slow which implies that the film will be like this for the rest of the movie. Fortunately for me, it wasn't. It was a movie that got better and better as it went along, as it hit different climaxes and toyed with the viewers emotions. All round, it is a landmark in cinema, thanks to the amazing performance by Sam Rockwell. But I wouldn't recommend to people with short attention spans, because you will never fully get the gift of it. I just watched this movie this morning and I loved it! There's something about the idea of being all alone, stranded, that totally creeps me out. Sam Rockwell is perfect in this role basically acting all by himself, and fully capturing that loneliness that is within his character. Good Review!